Author(s): Fatima Faisal, M. Tariq Qamar, Z. A. Rehan, M. Aslam, Almas Hamid, Iqbal M.I. Ismail, Huda A. Qari, A. Hameed. National Centre for Physics, Quaid-e-Azam University, Islamabad 44000, Pakistan. 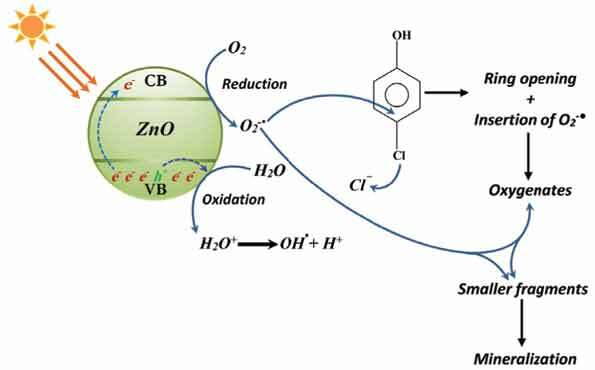 Although the photocatalytic activity of TiO2 polymorphs and hexagonal ZnO is well studied with artificial UV light sources, however, their efficacy is not well examined in natural sunlight exposure. In the current study, the photocatalytic activity of the polymorphs of TiO2 (rutile and anatase) and hexagonal ZnO was evaluated in sunlight exposure for the removal of resonance stabilized 2-, and 4- derivatives of chloro and nitrophenol isomers and compared with that of P-25. The polymorphs of TiO2 and hexagonal ZnO, after synthesis by sol-gel and hydrogel routes, were subjected to optical, structural and morphological characterization. The hexagonal ZnO exhibited significantly higher as compared to anatase and rutile polymorphs but comparable with that of P-25 in sunlight illumination. For the hexagonal ZnO, the ring opening route of degradation mediated by superoxide anion radicals was confirmed by the absence of non-hydroxylated aromatic intermediates whereas the contribution of both superoxide anion radicals and hydroxyl radicals was evidenced for the TiO2 polymorphs and P-25. The kinetics of the degradation/mineralization of substrates was also compared. Keywords: Chlorophenols, nitrophenols, P-25, Sunlight photocatalysis, TiO2 Polymorphs, ZnO. Affiliation:National Centre for Physics, Quaid-e-Azam University, Islamabad 44000, Pakistan. Keywords:Chlorophenols, nitrophenols, P-25, Sunlight photocatalysis, TiO2 Polymorphs, ZnO. Abstract:Although the photocatalytic activity of TiO2 polymorphs and hexagonal ZnO is well studied with artificial UV light sources, however, their efficacy is not well examined in natural sunlight exposure. In the current study, the photocatalytic activity of the polymorphs of TiO2 (rutile and anatase) and hexagonal ZnO was evaluated in sunlight exposure for the removal of resonance stabilized 2-, and 4- derivatives of chloro and nitrophenol isomers and compared with that of P-25. The polymorphs of TiO2 and hexagonal ZnO, after synthesis by sol-gel and hydrogel routes, were subjected to optical, structural and morphological characterization. The hexagonal ZnO exhibited significantly higher as compared to anatase and rutile polymorphs but comparable with that of P-25 in sunlight illumination. For the hexagonal ZnO, the ring opening route of degradation mediated by superoxide anion radicals was confirmed by the absence of non-hydroxylated aromatic intermediates whereas the contribution of both superoxide anion radicals and hydroxyl radicals was evidenced for the TiO2 polymorphs and P-25. The kinetics of the degradation/mineralization of substrates was also compared.